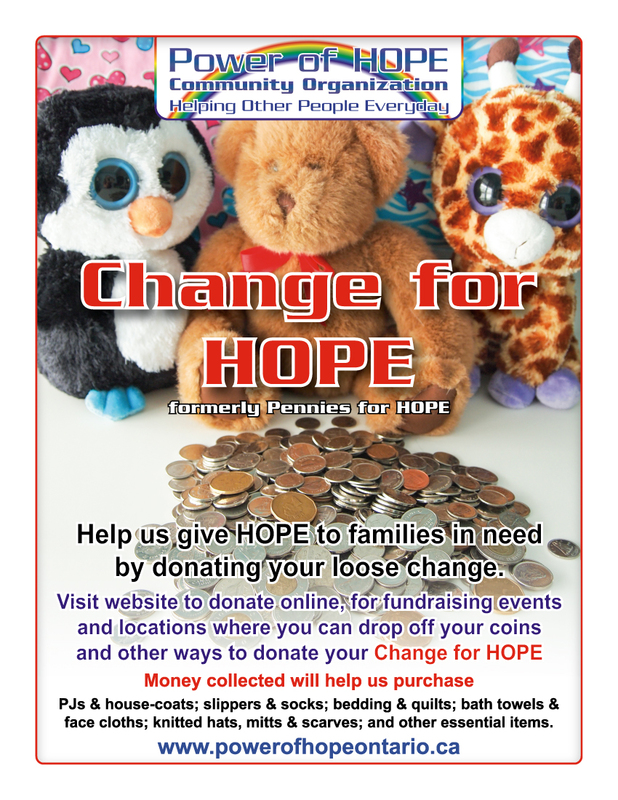 Throughout 2012 & 2013, Power of HOPE had a lot of success with its Pennies for HOPE Campaign, raising $2714 in Waterloo & Wellington and $557 in Woodstock & area. Our campaign continues each year but in 2014 after the Canadian penny expired, we changed its name to Change for HOPE and we collect all types of coins (and notes too)! You can help us give hope to families in need each and every Christmas and throughout the year by collecting the change from your morning coffees or your loose pocket / purse change then donating it to Power of HOPE. Take your coins to your bank then donate online through PayPal here. Please note: we accept all donation amounts. However, we are able to provide donation tax receipts. PJs & house-coats; slippers & socks; bath towels & face cloths; knitted hats, mitts & scarves; and other much needed items. Want to help by collecting at your place of work? Want to help us collect coins at your business or store location? Contact us for our Change for HOPE collection jar sticker. Provide a clear, sealed container with a slot in the lid. Print out the sticker and tape it to the front of the container. Place the container where your employees and/or customers can see it. Once the jar is full, use one of the methods above to donate the change collected.